Some of the photos I have posted on here now have “Buy Print – Buy Card – Send E-card” links above them. This comes courtesy of Fotomoto. Although I am an amateur photographer, I think some of my photos are worthy of selling prints for. I don’t expect to get rich from this, or even make enough to quit my day job, but if I can sell a few here and there, it can help me to upgrade my equipment or buy more photography books. That’s all I’m hoping for. 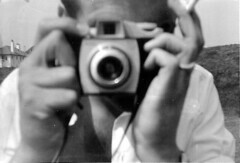 If you see a photo here that doesn’t have a purchase option that you would like to buy, or if there’s one Flickr photostream that you like, let me know and I’ll put it up here. Nothing new to post this week, so I picked another out of my collection. 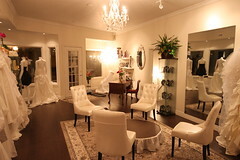 I took this photo of my sister's bridal shop a few weeks ago. This photo is being used in a printed ad in a wedding publication to be given out at bridal shows. While catching up on work this weekend, I decided to use the opportunity to grab a shot for my project using my cell phone. 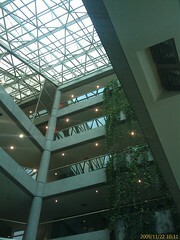 This is what it's like in the atrium at Corel Corporation. Every second floor has a catwalk that goes from the elevator side, over the atrium to the other side. This was taken from the 3rd floor catwalk, facing the elevators. Ok, I’m cheating on my photo of the week again. I didn’t take this photo. I scanned it a couple of years ago from one of many that my Mom had in a shoe box. This is my Dad. He passed away from liver cancer in 1998. Yesterday would have been his 71st Birthday. We spent a few hours at my sister's new bridal shop on Saturday, snapping photos of some of the dresses she sells to post on her web site. This is one of my favourites. 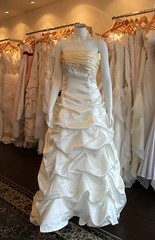 If you're looking for a bridal gown or a formal dress, she's got really great prices. She she puts it "outlet prices in a boutique setting". It’s Kimberley Wilson Bridal & Fashion Outlet on Beechwood in the New Edinburgh area. 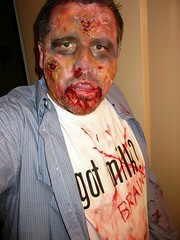 Week 12 - Got brains?